Elder Cory Fife was called to serve his Heavenly Father on a mission for the Church of Jesus Christ of Latter Day Saints serving in the Macon Georgia Mission. He was injured in a bike accident while serving in Savannah, GA. He has since been able to return to the mission field. He is now in the Tallahassee Florida Mission. We just want to continue to say THANKS! We are getting really close ! 3 weeks from Thursday! Can you believe it? Ok, so we're horrible at blogging when not a crisis! So, I was reading through another blog of a child that was injured and left a comment. I thought, "I ought to update our blog on Elder Fife...I'll bet it has been a little while". What an understatement that is! February was the last post. Please accept our apologies. Elder Fife was last in Alma, GA. He has since been in Theodore, AL (right near Mobile, AL). He has had several different companions and has seen the work really progress there. 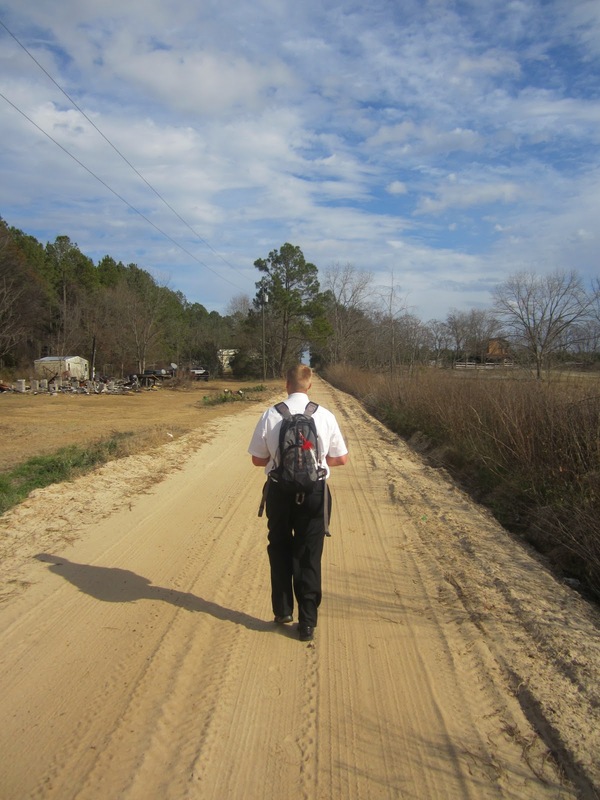 Before leaving Alma, GA. Elder Fife does like to work hard! Just in August, we had to go out to Mobile, AL to wrap up some legal stuff and got to see Elder Fife and his companion, Elder Prince. We got to see Elder Fife!!! He is doing so fantastic. His Mission President challenged all of the missionaries to memorize ALL of the Scripture Mastery scriptures (you know, the ones they should have memorized in seminary!?). Elder Fife has found that he still has the ability to memorize really well. He has memorized all 100. He and his companion got evacuated to Tallahassee, FL in front of hurricane Isaac. In an email to all of the missionaries (but I am sure it was aimed mostly at the Elders!) President Jensen said that he knew that many of the missionaries were praying to see a hurricane! And that all of their mothers were praying that they wouldn't. No your prayers are in direct contradiction to your mother's and you are to "stop it!". Linda couldn't have agreed more! Elder Fife said, "It rained just a little..."
So, Elder Fife is doing great, loving life, loving every minute of his mission. "I am honestly LOVING EVERY MOMENT that I have been given to serve the Lord!!!!! I honestly wouldn't change anything-past, present, and future (cuz I don't know what it holds???). That means that I wouldn't change my accident or any of it... because I know that without it I would not know what I know, the extent that I know it; nor would I be who I am today without it! I am so very grateful for the pain and suffering that I have been BLESSED to have gone through in my life....Now that may sound a bit crazy, but it really is a blessing, the trials that we face in life, cuz if ya think about it, God's gotta be trying to teach us something! Our task is to-FIGURE OUT WHAT???" We are so amazed at the growth of our son. He is such an inspiration to us, and to so many others. We love all of you, and keep you continually in our prayers. Cory is doing pretty well. He is serving in Alma, GA and is loving being in a small town. It is extremely rural (see photo! ), and for a kid who wanted to live in the middle of a 1000 acres growing up, it is just right. The work is going well. He has enjoyed his time with Elder C. (hamming it up together) I will try and post some more pictures later. Elder C and Elder Fife "dressed up" for District meeting! This year has been one to remember! 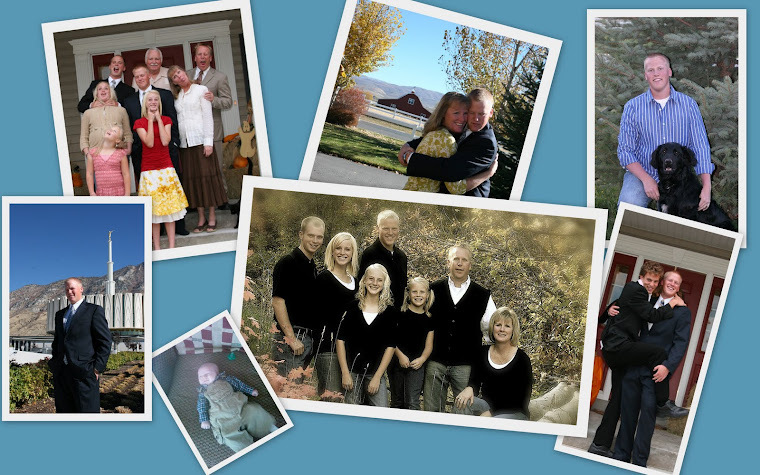 As 2011 comes to a close all of us here at the Fife's are grateful for each and everyday. We have had a lot of fear, worry and much that was unknown, but with the help of our Savior and Heavenly Father we are doing great! We look forward to a new year filled with a greater love, appreciation and understanding for our Savior, for the gospel, for our family and for the small and simple things in this life. This is a good transfer!!! Elder Snow and myself are working with a young man named Daniel Jones who is preparing to be baptized on January 5, 2012... I am Way excited! :D Yesterday, we were talking to him about his baptism after church and who he would like to have perform the ordinances and he asked me to Confirm him and more importantly, he asked Elder Snow to Baptize him!!! We are both very excited for that... I know, from personal experience, the JOY that performing your first baptism brings. I know that it helps you to see the fruits of your labors... It is kinda like when I am teaching somebody, I can literally see a light bulb turn on as if they are saying,"Oh yeah....I remember that!" Working with Daniel these last couple of weeks has been just that. Everything we have been teaching him, he agrees with and is so willing to live/keep every commitment we leave him with. As we continue to teach him it seems like he is just radiating more & more light. He is soaking the gospel up! Daniel is literally an answer to, both mine and Elder Snow's, prayers. Annie Baggs who was baptized Dec. 8th is still down in Ocala, but she is active... We have stayed in touch with her and she said that she's been to church the last two weeks! From what she told me during her baptismal interview, I would say that she is DEFINITELY converted to the gospel. Then in working with less-actives, we have started to make some progress with Rachel Crowley, we found out who her home teachers are and are now trying to set up a day that we could go see her with them... should be soon. My studies have really been great this week... I did a lot of soul searching and evaluating my decision to serve. I have come to the conclusion that I might have started for other reasons, but that I really am "still" out here for the right reasons. I am motivated out of a sincere desire to serve and out of love. Love for the people-those that I serve and serve with-,love for my family, and most of all love for my Savior! I have been given a lot of things, things that I am eternally grateful for. It was good to talk to yall too! Hearing yall's voices was just so comforting...when I talk to yall on Mother's day, I gots an idea....but you will just have to wait and hopefully I won't forget.and Dinner was great, THANK YOU!!!! Preaching on a rock in the Free Speech Zone....Good Fun! They tried to figure me out... NO luck! To post a comment, you have to be reading the individual post. Just select the title (in blue above each post) and you should then see comments at the bottom. Cory's Mom and Dad here.